A month after oil started gushing from BP’s ruptured Gulf well, we’re officially witnessing a fishery disaster, BP refuses to use less toxic chemical dispersants, and oil is sinking into Louisiana’s shores–with horrifying results. CNN reports that the National Oceanic and Atmospheric Administration has closed almost 20% of all commercial and recreational fisheries as a result of the spill, and now U.S. Commerce Secretary Gary Locke has declared a fisheries disaster in Louisiana, Mississippi, and Alabama–a move that lets the federal government send in extra resources to help with cleanup. No word on how much cash will be offered or when the government plans to provide funds. In the meantime, oil is still gushing into the Gulf unabated, and BP continues to try every far-fetched solution it can think of. Next up is the “Top Kill” approach, which involves pumping drilling mud into the leaking pipe and sealing it with cement. BP estimates that the approach, expected to start on Wednesday, has a 60% to 70% chance of success–but we’ll only be satisfied when we see this thing work. If the Top Kill approach fails, don’t be surprised if the federal government steps in. BP may be racing to plug the leak, but the tarnished oil giant doesn’t seem to care about the environmental impact of the spill. 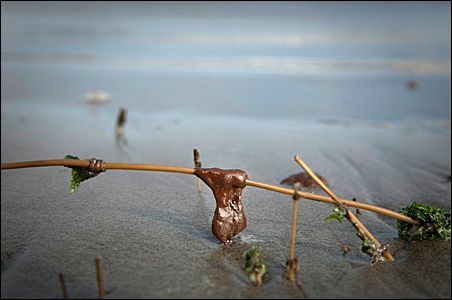 The EPA ordered BP to scale back on the amount of Corexit (a toxic chemical dispersant) it uses in the spill, but BP refuses. In a statement, EPA Administrator Lisa P. Jackson expressed her concerns: “We are still deeply concerned about the things we don’t know. The long-term effects on aquatic life are still unknown and we must make sure that the dispersants that are used are as non-toxic as possible.” So why won’t BP let up? Dispersants keep oil away from the ocean surface–and away from the prying eyes of the public. As these images from the Big Picture demonstrate, that effort at secrecy isn’t exactly working. But while reporters are having a difficult time gaining access to the spill sites, crowdsourcing will hopefully ensure that every little detail of this disaster is recorded. 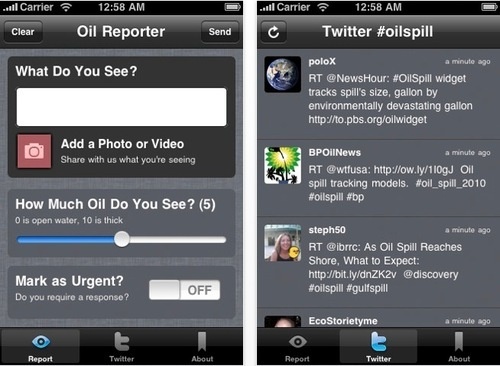 The Oil Reporter iPhone app called allows users to record audio and video of the spill and provide info on emergency situations. Urgent submissions go straight to CrisisCommons, an organization working to crowdsource disaster response. On the morbid side of things, gambling website PaddyPower.com is taking bets on spill-related extinctions. The New York Times reports that Kemp’s ridley turtle looks most likely to go first, while species like the gulf sturgeon, smalltooth sawfish, and elkhorn cora are less likely to disappear. PaddyPower seems to be flip about the whole thing, but the site serves as a startling wake-up call–yes, this spill might be so bad that entire species die out as a result.